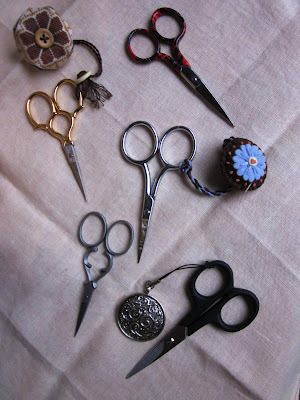 It is no secret that I love embroidery scissors. I'm starting to amass a fair and growing collection. I love that they have so much variety and that the variety can be purely decorative, or it can mean the perfect design for very specific applications. I also love matching a pretty pair to a lovely project. 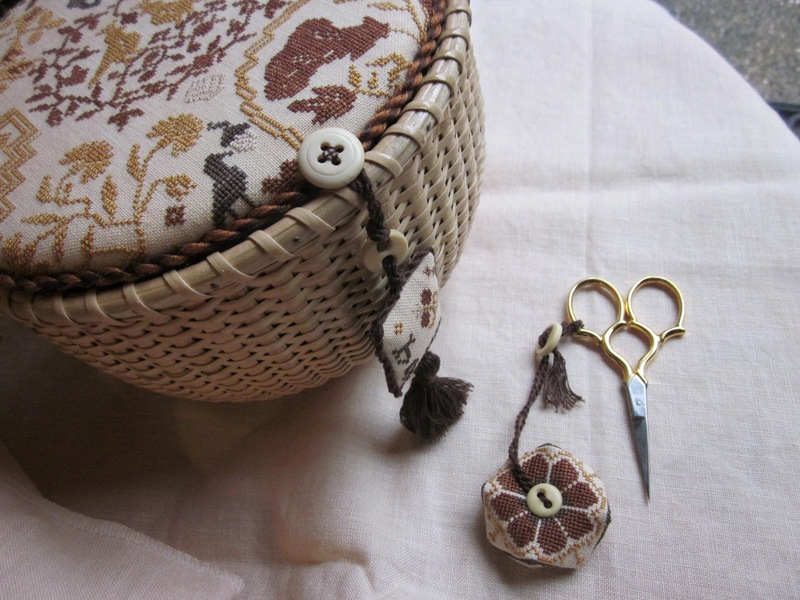 Completed Primitive Traditions' 'Abigail Colby' workbasket and fob. 1. "Mia" - Designer Series, limited-edition 4-inch scissors. I confess to having purchased these just because of the pretty tartan pattern on the handles. My heritage is part Scot so I could not pass them up! Other than that, they are a good all-around scissor. 2. Epaulette - 3.5-inch gold color scissors. This is one of Gingher's standard pairs, available at craft stores everywhere, but it really is a good quality little scissor. This pair was a gift from my grandmother and looks so pretty with the workbasket above! 3. Large-hole 4-inch standard scissor. Another one easily found at craft stores. I do not have large fingers, but sometimes it's nice to have a little extra wiggle room. This pair has a nice weight in the hand and gives a satisfying snip, and lives in the project bag for one of my large-count Chatelaine mandala projects. 4. Collector's series, 3.5-inch in pewter finish. These are Gingher's top-of-the line embroidery scissors and cost about twice as much as their standard pairs (I had a coupon) but oh, they are sweet. Very finely crafted and very sharp with finer blades than the other models. 5. Lightweight series 4-inch. Gingher's "Lightweight" line is the budget series, which have plastic handles and coarser blades than the other models..and are cheaper too of course. Like all Ginghers they cut well, but the blades on this pair are not going to work for hardanger or very delicate stitching. I like to use this pair for coarser forms of embroidery like Brazilian, or as a travel pair for road trips. They are a little too big for the airplane, but for road trips they are hard to misplace and easily replaced if they do get lost.